10 October 1945. 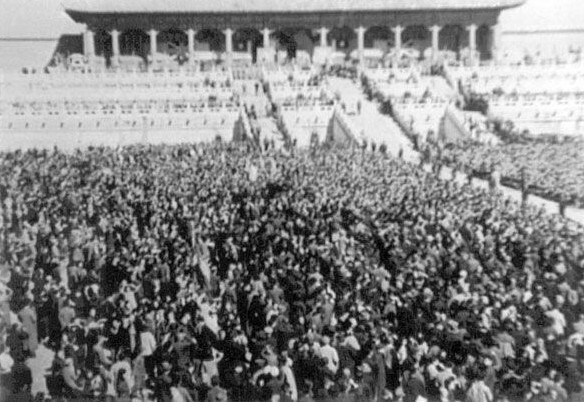 After the arrival of Chinese government forces in the city, the Japanese North China Area Army formally surrenders in Peiping in a large-scale public ceremony. 10 October 1945. Much of the West Javanese city of Bandung is in local hands. Beneath the facade of Republican authority, however, an inconspicuous Japanese control remains; few weapons have been handed over. When local pemuda attempt a forceful takeover and seize an arms factory, the Japanese swiftly counterattack and within a day have subdued the city. They surrender Bandung to arriving British troops on the 18th. 10 October 1945. Prompted by De Gaulle, King Sisavangvong dismisses Prince Phetsarath as prime minister of Luang Prabang and strips him of the viceroy title. The move is two days after Lao Issara leaders informed the king of their intention to establish a constitutional monarchy and a day after an informal parliament was created by the Lao-penLao in Vientiane. Nationalists respond to the sacking by forming a revolutionary government, which in turn appoints a provisional national assembly and invites the king to dissolve his royal government. On the 12th, it proclaims the country’s independence under its authority. A provisional constitution, national flag and anthem are also approved. Meanwhile, young Lao loyal to Phetsarath and his Lao Issara allies begin to take over the old colonial administration. On the 15th, Phetsarath formally accepts his vice-regal demotion; the prince is confident of his ability to govern without a royal mandate. 10 October 1945. When British troops begin disembarking at Belawan (outside Medan) and Padang, they find a newly established and assertive Republican authority. The situation encourages pro-Dutch militias to act more aggressively, provoking the first serious anti-Dutch violence in Medan on 13 October. This forces the British to despatch significant reinforcements to Medan by the end of the month. 10 October 1945. Veteran communist leaders Tokuda Kyuichi and Shiga Yoshio are at last free after spending 18 years in prison for their party activities – but not before they have briefed General MacArthur’s HQ on the Party’s post-war plans. They are among about 3,000 political prisoners released after the war on the orders of the occupation authorities. 10 October 1945. As part of the American strategy to transport Chinese government forces to the north and repatriate surrendered Japanese troops home, U.S. naval forces secure Tsingtao, the best port north of Shanghai. 10 October 1945. After a number of Viet Minh attacks are launched on French and British positions in Saigon the previous night, General Gracey orders advances into Saigon’s northern suburbs, further stretching his overextended forces. Later that day, he flies to attend an inter-allied conference in Singapore together with General Leclerc. Here he faces criticism for his actions but is backed by Leclerc. The increasingly concerned SEAC commander, Lord Mountbatten, who also faces major security problems in Indonesia and political headaches in Burma, Thailand and Malaya, is frustrated by the uncompromising French attitude and wants to avoid having his forces drawn into a full-scale conflict. He grants Gracey additional reinforcements but demands that the general works to promote a French–Viet Minh dialogue. 10 October 1945. Exasperated by claims of the Korean People’s Republic to be the legitimate government of Korea, General Hodge asserts that the U.S. military government is the only legitimate authority in Korea south of the 38th Parallel. Henceforth, military officials begin taking over local government offices across the south and ejecting KPR representatives. 10 October 1945. The Colonial Secretary provides the details of the Malayan Union plan to the House of Commons. The Union would include the nine states of the Malay Peninsula (including Penang and Malacca), while Singapore would be kept as a special colony ‘owing to its special needs’. 10 October 1945. About six weeks after the start of negotiations in Chungking, a joint KMT–CCP communiqué emphasises progress. Both parties claim to accept three principles: peaceful national reconstruction, dispute resolution via negotiation, and maintenance of legal and equal rights of different political parties. Nonetheless, substantial divergences remain. Mao flies back to Yen’an the following day, Chou En-lai staying on to continue the negotiations.